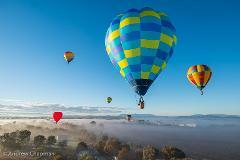 A beautiful one hour balloon flight in the King Valley including in-flight photography. From the vineyards and patchwork of fields, the views expand to the Ovens River, spectacular Mt Buffalo, Mt Stirling and the High country beyond. 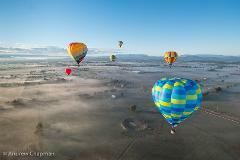 A beautiful one hour balloon flight in the King Valley including in-flight photography. See the breathtaking scenery of the King Valley then celebrate your flight with a delicious Prosecco breakfast at Brown Brothers afterwards (optional). A spectacular one hour balloon flight in the Mansfield district, with in-flight photography included. Live the romance and adventure of a hot-air balloon flight in the High Country at dawn, and experience a glorious sense of freedom. Gift Voucher for any of our Goldrush Ballooning flight products, your choice ! Nominate value by arrangement - just contact us.